3. Trade Price Promotion - to help retailers offer consumers incredible discounts of up to 60% on a great selection of core products. 4. A Consumer Promotion and Support Package, offers an array of effective marketing tools and merchandising solutions, designed to ensure products don’t just sit on the shelf. 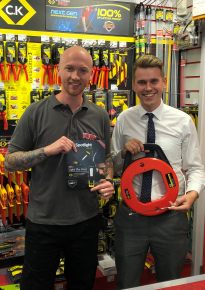 One customer in particular, who is really reaping the rewards of signing up to Quantum, is Luke Young, Assistant Manager at Electrical Wholesalers, CEF, in Stourbridge who, from selling hardly any tools at his branch, now cannot keep product on the shelf! Luke has also decided to add extra impact in store by taking on a 1m C.K backing board display, to allow products to be quickly identified and selected, which has been another important factor in driving impulse sales.